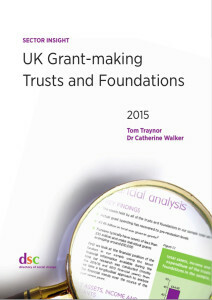 A detailed analysis of UK grant-making trusts and foundations, where they give and the causes and beneficiaries they support. DSC’s Head of Research, Tom Traynor and Dr Catherine Walker explore the finances and practices of grant-making trusts and foundations in the UK, analysing where they gave £2.65 billion of funding and what they gave it for in this insightful study. The report includes: an overview of trusts and foundations and their role in society; financial trends for assets, income and grant-making; geographical distribution of grants; causes and beneficiaries supported; survey findings including application levels, percentage of awards to new applicants and operational challenges. Essential intelligence for funders, policy-makers and practitioners in the voluntary sector.